Another chapter in the success story of the popular Rhyzm rubber is written by the JOOLA Rhyzm-Tech. Due to modifications of the sponge, which has again been designed with considerably larger pores, a real catapult machine has been developed. 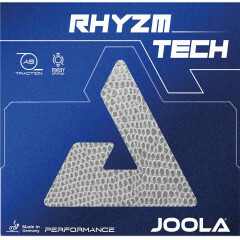 The JOOLA Rhyzm-Tech is a rubber that supports any rotation input in all situations and therefore gives all active topspin players an extra boost. The JOOLA Rhyzm-Tech is a challenge to overcome. Once this is managed, you can reach a new, significantly higher level. Joola Rubber Rhyzm Tech is beeing added to cart.